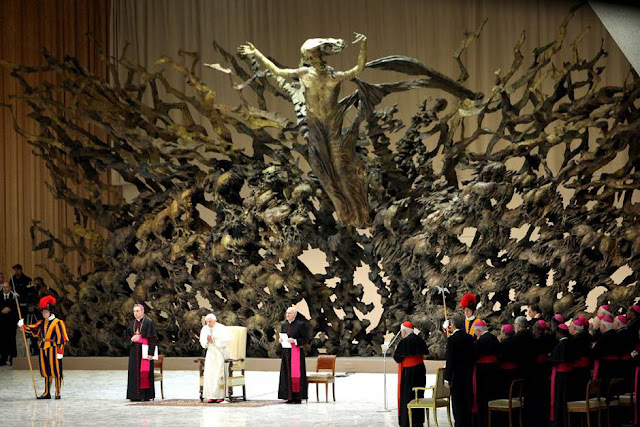 The Resurrection (La Resurrezione) is an 800-quintal (8 metric ton) bronze/copper-alloy sculpture by Pericle Fazzini in the Paul VI Audience Hall in Rome. Intended to capture the anguish of 20th century mankind living under the threat of nuclear war, La Resurrezione depicts Jesus rising from a nuclear crater in the Garden of Gethsemane and its dimensions are 66 ft × 23 ft × 10 ft (20.1 m × 7.0 m × 3.0 m). The commission for the work was ordered by Count Galeassi in 1965; casting began at the Michelucci Art Foundry in Pistoia in 1972; the final sketch was produced in 1975; and the work was completed and inaugurated on September 28, 1977. The original work was done in polystyrene and the fumes of the burning plastic gave Fazzini a blood clot during its production. It was restored over 3 months in 2011. Sukkot begins at sundown on Sun, 23 September 2018.